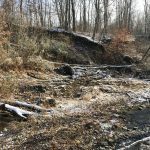 During the winter of 2017-18, the Clermont County Water Resources Department partnered with the Clermont Soil and Water Conservation District to restore an unstable, 620-foot stretch of a tributary to O’Bannon Creek using natural channel design techniques. The projected was funded in part by a Section 319 grant from Ohio EPA. River, where excess sediment is a particular concern. Habitat surveys of this stretch showed low stability and limited instream cover for fish and other aquatic species. Prior to restoration, the existing channel was undersized for the watershed it drained. A new channel was created with the appropriate width and depth. Also, the curvature of the bends in the creek was adjusted to reduce the shear stress (and subsequent erosion) on the outside banks of these bends (see photo on right). 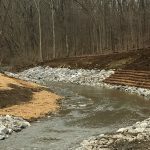 To help maintain the channel profile, three riffles (faster moving, shallower sections of a stream) were constructed in the project area. The constructed riffles help prevent erosion of the stream bed and also provide important stream habitat for both fish and macroinvertebrates by adding areas for hiding, spawning and feeding. Riffles also help add oxygen to the water as it rushes over the rocks. Much of the material used to construct the riffle was harvested on site. Bank stabilization structures called toe woods were installed on the outside banks of the two bends in the project area. Toe wood structures are essentially layers of logs and branches placed at the lowest part of the stream bank (the “toe”) and backfilled with soil. Once the toe wood structures were installed, crews planted live stakes of willows and other species within them. These structures have two primary functions, the first of which is to reduce streambank erosion on outside bends. Secondly, toe woods help improve habitat for fish and other aquatic species. Over time, the stream will scour a deep pool under the toe wood structure. These pools help fish survive during the winter and periods of drought. Above the toe wood structures, fabric-wrapped soil lifts were installed to rebuild the streambank and create bankfull benches. Dormant willow stakes were placed in between the soil lifts. 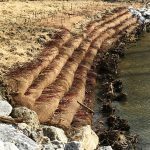 The portion that protrudes from the lift will help to protect the bank from erosion, and the roots will reinforce the soil as they develop. View construction video here. The project involved the creation of new floodplain along two-thirds of the left descending bank of the creek, and bankfull benches along the right bank (shown above soil lifts in photo above). By allowing the stream to access the floodplain, water is now able to spread out and slow down during high flows. 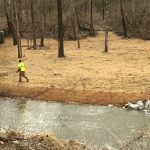 By doing so, the erosive capacity of the stream is reduced, and sediment and associated pollutants are able to drop out of the water in areas where the velocity slows. 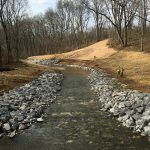 Native species were planted and seeded in the newly established flood plain and on bankfull benches, establishing a diverse and complex riparian habitat in the new floodplain and on the re-graded banks. Many species of aquatic macroinvertebrates spend part of their life cycle on land. Greater diversity in the types of plants bordering a stream will generally lead to a more diverse macroinvertebrate community (and a more diverse food source for a healthier fish community).